Henry Harmon Spading established a Nez Perce Indian mission at Lapwai in 1836. Reverend Spading and his wife introduced Christianity, agriculture, and opened the school in Idaho for Indian children. In 1839 Henry Spading began publishing the Bible in Lapwai on the earliest printing press in the Pacific Northwest. Chief Timothy of the Nez Perce, the first native Christian leader, was baptized at Lapwai on November 17th, 1839. The amicable relationship between the Nez Perce and the White Men lasted many years, but began to slowly deteriorate as more and more settlers arrived in their lands, and with the discovery of precious metals in Idaho. In 1855 U.S. Officials persuaded the Nez Perce to sign the Walla Walla Treaty in which they sold much of their lands for less than 8 cents an acre. The treaty ordered the Nez Perce to relinquish their ancestral territory and move to Oregon's Umatilla Reservation with the Walla Walla, Cayuse, and Umatilla Tribes. However, all the tribes so opposed this plan that Territorial Governor Isaac Stevens granted the Nez Perce the right to remain in their own territory, on the condition that they relinquish nearly 13 million acres to the U.S. government. A large reservation (10,000 square miles) was established across central Idahowas established across central Idaho and into the Wallowa Valley of Oregon. Many of The People moved into Idaho. Some however remained in the Wallowa Valley. Among these was Old Chief Joseph and his band. In 1860 gold was discovered on the Nez Perce lands near Orofino Creek. Soon a gold rush to the reservation was underway. Lewiston became a main supply town for the rush and prospectors began flooding into the area. Encroachment by the whites was in direct violation of the Walla Walla treaty and the Nez Perce petitioned Washington to stop the rush. A company of cavalry was sent to the Nez Perce Reservation in 1862 to attempt to prevent whites from settling on Nez Perce lands. The troops were ineffectual, and a second cavalry company was sent to establish a fort at Lapwai. Fort Lapwai was constructed in the Lapwai Valley, 12 miles southeast of Lewiston. The post was originally manned by Volunteers but replaced by Regulars in 1866. Although originally intended to protect the Nez Perce treaty rights the Fort soon became the center for U.S. attempts to convince the Nez Perce to relinquish treaty lands that contained gold. In 1863 the federal government entered a new treaty that reduced the reservation established in 1855 to only 1,000 square miles. The reduced reservation was called the Lapwai Reservation and the Nez Perce were told to move onto it. This treaty became known as the "Thief Treaty" as only about 1/3 of the Nez Perce Chiefs signed the document, yet the U.S. Government insisted it applied to all Nez Perce. Some of the Nez Perce refused to leave the Wallowa Valley in Oregon. Among them were Old Chief Joseph and his band. These Nez Perce were allowed to occupy a small strip of the Wallowa Valley in Oregon. When Old Chief Joseph died in 1871 his son, Young Chief Joseph (born in 1840) became the leader of the Wallowa Nez Perce. He was given the name Hin-mah-too-yah-lat-kekt, or Thunder Rolling Down the Mountain. Over the next years Chief Joseph would become a national celebrity and earn a place in history as one of the greatest leaders of all time. In 1877 the Federal government ordered all Nez Perce, including those in the Wallowa Valley, to move onto the Lapwai Reservation. Having no wish to leave their homeland, Chief Joseph argued for the rights of his people to remain in Oregon. They were denied, and an ultimatum was issued by General Oliver Otis Howard, stating that if they did not relocate war would be inevitable. The General imprisoned one of the Nez Perce priests to help with his persuasion. Chief Joseph was not a military leader (the War Chief of his band was Chief Looking Glass), and did not wish to fight. He also wished to free his friend. Thus, Joseph and his band prepared to move to Lapwai. Before they could do so however a band of Nez Perce led by Chief White Bird ambushed a massacred a group of whites in the Salmon River country in northern Idaho. Although Joseph's people were not part of that band, as "non-treaty" Indians they were now considered hostiles and cavalry was dispatched to avenge the Salmon River incident. It seemed war was now inevitable. Chief Joseph gathered his band and together with White Bird's (and others) they began their famous journey of over 1,200 miles towards Montana hoping to find shelter with the Crows who were traditionally friends of the Nez Perce. This journey became known as the Nez Perce War. Eventually troops caught up with the Indians at Bear Paws in Montana. About half of the remaining Nez Perce continued on into Canada, the other half, with Joseph, sought to return to the Lapwai reservation - something which took years to accomplish. They were sent to Kansas, then to Oklahoma and then to the Colville Reservation in Washington. Eventually, Chief Joseph was able to secure permission for the Nez Perce to return to Wallowa and Lapwai in the late 1880s. He himself was denied that permission, and remained at Colville until his death in 1904. 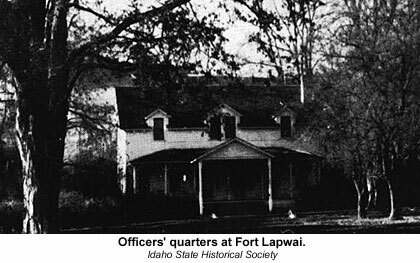 In 1884, Fort Lapwai began to lose its value as a military installation and was abandoned by the Army. It was taken over by the Lapwai Indian Agency at the turn of the century. The Fort site is now a part of the Nez Perce National Historical Park. From Lewiston, take US 9S east of Lapwai; one mile south of town is the Indian Agency.